AHOY! Four tiers AHOY! 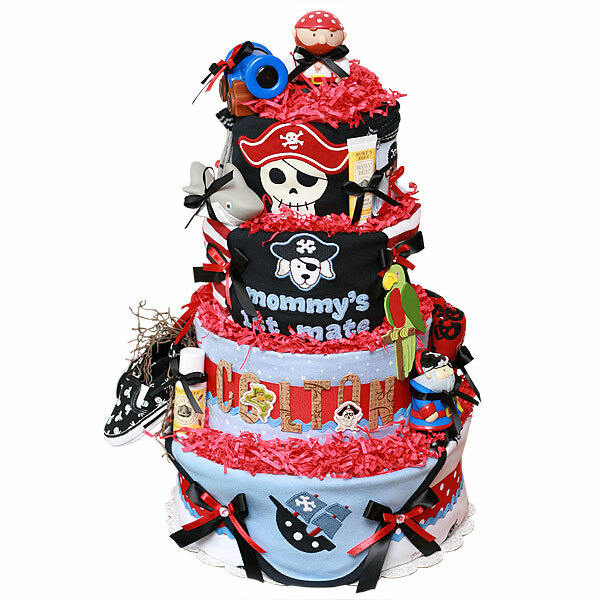 Pirate Custom Diaper Cake is made of 35-40 Pampers Swaddlers diapers size 1-2 (8-15 lbs); 40-45 Pampers Swaddlers diapers size 2 (12-18 lbs); Two flannel receiving blankets 100% Cotton; Pirate Squirters Bath Toys by Alex toys; One Burt's Bees Baby Bee Getting Started Kit (kit containing apricot baby oil, buttermilk lotion, buttermilk bath, buttermilk soap, diaper ointment, dusting powder, and shampoo bar); All baby items with pirate theme and skulls: 2 pairs of socks with pirate ship and monkey-pirate by Gymboree; One baseball cap says "LIL PIRATE" by Gymboree; One long sleeve bodysuit says "mommy's 1st mate" by Gymboree; One 2pc set Amy Coe sleepwear red with skulls; One 2pc set Gymboree sleepwear dark blue with skull and a pirate hat; One pair of baby shoes by KoalaBaby size 1 black with skulls; One blue blanket with pirate ship by Gymboree. Black, red and blue ribbons and bows, red crinkle paper, wooden embellishments with pirate theme. The diapers are held together by elegant ribbons (no glue on diapers). Ribbons are hand-stitched with white embroidery floss on the back of the cake, allowing for a clean, handmade look. Decorated scrapbook embellishments, bows and crinkle paper. This cake sits on a 12" corrugated cake board and more than 19" high. Comes wrapped in cellophane with coordinating ribbons and bows. All our diaper cakes made of highest quality ingredients with greatest care and love. Everything included is ready to use and easy to disassemble.